As there are usually no symptoms, the correct measurement of blood pressure is the safest way to learn how to walk the blood pressure levels of an individual. Despite being a simple, often blood pressure measurement is often done incorrectly, even by doctors. 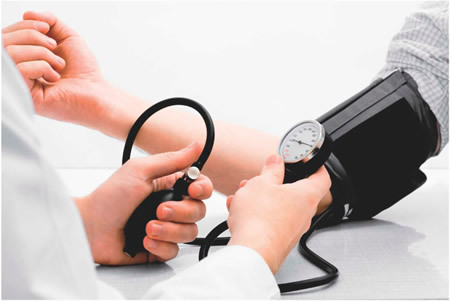 In this article we will discuss the right ways of measurement of blood pressure values. One of the most common mistakes in measuring blood pressure is to find you do not need any preparation before the pressure to be measured. Simple and trivial situations such as smoked or have done some physical effort just before the measurement values can cause artificial elevations in blood pressure, leading to a misinterpretation of the degree of the patient's hypertension. Another common mistake is to measure the blood pressure more than once then without giving at least 1 minute interval between each measurement. The patient should be seated and calm for at least 5 minutes before the measurement. Patients should refrain from doing physical exercise, smoking or ingesting caffeine during the 30 minutes preceding the measurement. Do not measure your blood pressure if the patient is willing to urinate. A correct blood pressure measurement requires the use of a suitable clamp the circumference of the patient's arm. Obese patients may need a device with a larger cuff. Patients with major arms, over 45 centimeters circumference may require that the blood pressure is measured on the forearm, arm and not, as is customary. Another option is to use an apparatus with high clamp, made to measure the pressure in the thigh. This clamp size, however, is usually not so easy to find. Any of the above can lead to incorrect data medication, overestimating the value of blood pressure. A small clamp in relation to the circumference of the arm, for example, may cause erroneous readings, giving values 30/10 mmHg above to the correct (e.g., a 130/80 mm Hg pressure with patients may have values of up to 160/90 mmHg; if he is obese and the clamp is small). The part of the cuff which inflates to cover at least 40% of the circumference of the arm. The opposite is also true. young patients with very thin arms need a lower bracket, otherwise your blood pressure values may be underestimated. There are two types of sphygmomanometers, popularly called pressure device: manual and automatic. Unlike current automatic and digital devices that can be handled by the patient, the manual sphygmomanometer classic requires someone else to measure the pressure of the patient. This is often a problem, especially when it comes to elderly people who live alone or with only one other elder. In fact, anyone can measure the blood pressure of anyone, however, minimal training is required for the procedure is done correctly. The patient should be placed sitting with both feet touching the floor with your back straight, resting on the back of the chair. The arms should be straight, supported on a desk, at about the same height as the heart. Place the cuff around the patient's arm (preferably the left), getting the same about 2 cm above the cubital fossa (arm bend). Palpate the brachial artery just below the cubital fossa and put the stethoscope diaphragm upon this. With the stethoscope ear, begin to inflate the cuff. From a certain point, you will begin to hear the artery pulsation. Continue inflated to the sound of the pulse disappear. Begin to empty the cuff very slowly. When the sound pulse reappears, see what is the value that the device is showing. This is the systolic pressure, popularly called maximum pressure. Continue deflating the cuff. When the sound pulse disappear once, see what is the value that the device is showing. This is the diastolic pressure, popularly called minimum pressure. Blood pressure may be different in each of the arms. Values of up to 10 mmHg difference are considered normal. Likewise, throughout the day, the values tend to change. The pressure is usually lower upon waking and highest in the evening. So the ideal is always to measure blood pressure on the same arm and at about the same time of day so that the values are comparable. Automatic and digital pressure devices have gained popularity in the late 1990s and early 2000s Its great advantage is to allow the patient to measure their own blood pressure several times a day without needing the help of others. The procedure becomes much simpler because the patient simply take the appropriate position, put the device around the arm and give the order for him to measure the pressure. Within seconds, the result will appear on the monitor. Despite being very practical, digital devices, if they are not of good quality, can provide not very reliable results. Before buying a digital device to measure pressure, make sure that it has the INMETRO seal and was approved by the Brazilian Society of Cardiology. Currently, only some models of brands Bioland, G-Tech and Geratherm have both seals. What is the best place to measure blood pressure? The location most suitable to measure blood pressure, either with manual evenly-matched or digital, is the arm. There is no preference for left or right arm. As the pressure in one arm is usually slightly different from the other, just for future comparison purposes, the ideal is to assess the pressure always on the same arm. Many digital devices are made to measure blood pressure at the wrist. Measuring the wrist is not as reliable as to the arm, for the position even during the measurement is able to change the results. So that the measurement is correct, the handle must be supported on a table at the same time the heart. If the arm is up or down, the results are not valid. There are also market automatic devices that measure the pressure on the finger. These devices are unreliable because the blood pressure at the ends of the upper limb is different from the rest of the body. As mentioned above, the forearm is an option for obese patients and should not be the first choice if the patient has an arm circumference less than 40 cm. In extraordinary cases, the blood pressure can be measured in the thigh or calf, but usually this is only necessary in patients who have any impediment in the upper limbs.